From the New York Times best-selling author of The Marriage of Opposites and The Dovekeepers comes a soul-searching story about a young woman struggling to redefine herself and the power of love, family, and fate. Growing up on Long Island, Shelby Richmond is an ordinary girl until one night an extraordinary tragedy changes her fate. Her best friend's future is destroyed in an accident while Shelby walks away with the burden of guilt. What happens when a life is turned inside out? When love is something so distant it may as well be a star in the sky? Faithful is the story of a survivor filled with emotion, from dark suffering to true happiness - a moving portrait of a young woman finding her way in the modern world. A fan of Chinese food, dogs, bookstores, and men she should stay away from, Shelby has to fight her way back to her own future. In New York City she finds a circle of lost and found souls - including an angel who's been watching over her ever since that fateful icy night. Here is a character you will fall in love with, so believable and real and endearing that she captures both the ache of loneliness and the joy of finding yourself at last. For anyone who's ever been a hurt teenager, for every mother of a daughter who has lost her way, Faithful is a road map. Alice Hoffman's "trademark alchemy" (USA Today) and her ability to write about the "delicate balance between the everyday world and the extraordinary" (WBUR) make this an unforgettable story. With beautifully crafted prose, Alice Hoffman spins hope from heartbreak in this profoundly moving novel. This is a story of dealing with guilt and grief. The characters are honest and I was left with feeling hopeful at the end of the book. We are all flawed. We all have things in our last we have to overcome. We can move on. The narration could have been better but this was an enjoyable listen. Very surprised by how much I enjoyed this book. So very different from the other Hoffman books I've read. The narration is superb. I thought the story dragged along and I didn't quite care for the main character. She just wasn't someone I rooted for throughout story. You slowly become addicted to it. But it took me three starts. Tiresome and the story felt like a paint-by-numbers plot involving a cliched "damaged" girl who is rescued by the love of others, especially cardboard decent boyfriends. Wanted to bail but finished because it was relatively short and the narrator did a good job with the material. The beginning of Faithful got me interested, but by the end of the book I didn't really care what happened. The story lacked depth, though the concept had great potential. I was really surprised at how little I cared, as I have enjoyed other Alice Hoffman books. Tamblyn's narration here was hard to take as well. The description that comes to mind is forced-sounding monotony. Her narration lacked inflection and in my opinion conveyed a sense of apathy. A disappointment. Faithful: notions of fidelity weave in and out of the book. Hoffman delivers again - a sweet character portrait well read. And a number of lovely canine characters that win you over. It took me 3 days to read this wonderful story. You grieve for Shelby root for he on her path for redemption-- From death to love. Alice Hoffman's book has themes of mother / daughter love, finding one's self or identity and what is alive. Enjoy. 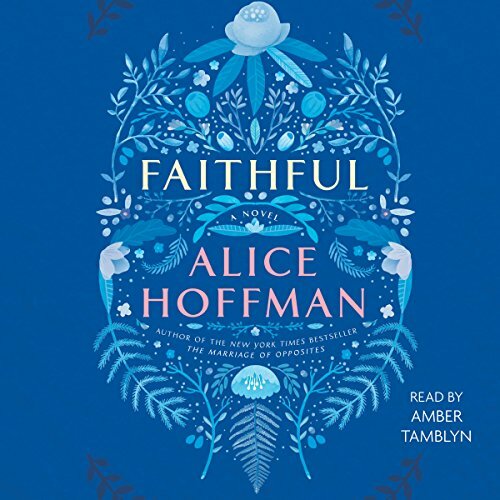 I used my Audible credit on Faithful because of an Audible editor review. I'm so glad I did. It just bumped into the number one spot for books I read this year. It might make my top 10 of all time list. Wonderful story and Amber Tamblyn narrated it perfectly. We have two teen girls who get into an horrific car accident, and while one survives, the other is put on life support for years as her mother waits for her to wake up. The surviving teen goes into a deep depressing with severe survivors remorse. She cuts off all of her hair, tries to kill herself, and lives like a recluse. She seeks comfort in booze and drugs and has no purpose in life. We follow her life as she starts to open up again. She becomes involved in relationships, she gets a job, she makes friends, she falls in love with animals and she goes to school. We follow her while she makes peace with the fact that it's not her fault that she is alive and her best friend is a vegetable. The book has beautiful prose and it's a very feeling book. Hoffman has a real knack for tugging on the heart strings and getting into the minds of people who can relate to having depressing feelings. It's just that- well, the book is extremely depressing. I shed a couple of tears. Very good fiction if you like stories that are fairly upsetting. Mit jedem Kapitel fühlt man mehr mit Shelby mit, eine sehr emotionale und mitreißende Geschichte.